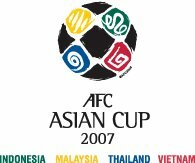 The Asian Football Confederation has confirmed that the final competition of the AFC Asian Cup 2007, co-hosted by Indonesia, Malaysia, Thailand and Vietnam, will take place from 7-29 July 2007. The final round draw will be held in December 2006 following the completion of the qualification competition, which begins on 22 February and ends on 15 November 2006. The first two qualifying matches are scheduled for 22 February and 1 March with other matches played on set days in September, October and November. However, in a concession to the AFC members (Japan, Korea Republic, Iran, Saudi Arabia and Australia) participating in the 2006 FIFA World Cup, the organising committee will allow those teams to reschedule their Asian Cup qualifiers on 1 March to 1 September 2006 so that they will be able to arrange warm-up friendlies on that date. Prior to the draw for Asian Cup qualification held at AFC House in Kuala Lumpur today, it was announced that Sri Lanka had withdrawn due to their poor performance in the SAFF tournament. Their action is being referred to the AFC Disciplinary Committee which can impose sanctions. Pakistan, which lost its preliminary play off for qualification against Bangladesh, was selected to replace Sri Lanka. The top two from each of the six groups will qualify for the finals along with Indonesia, Thailand, Malaysia and Vietnam who qualify automatically as co-hosts. AFC president Mohammed bin Hammam said he expected all the top teams to progress and was relieved that the possibility of three leading teams being drawn in the same group didn’t happen. "It could have been a worse scenario, where one of the top teams faced elimination but now I think all the top teams will go through,” he said as reported by AFP (5 Jan). "From our point of view, the commercial side of things is going well. The TV is fixed up and all we need now is for the fans to fill the stadiums." However the co-hosting of the finals by four countries is a decision the AFC now regrets. "It is proving very difficult for us. We have to have four organising committees, four media centres and there are also financial considerations," bin Hammam said. "It was my mistake. If we had a choice we definitely wouldn’t do it again." "Part of the problem in 2007," AFP commented, "is that Vietnam is a co-host and the country is now embroiled in wide-reaching football corruption scandals. Bin Hammam said he had told the Vietnamese authorities that no Vietnamese officials would be used in AFC events until the problem was fixed."